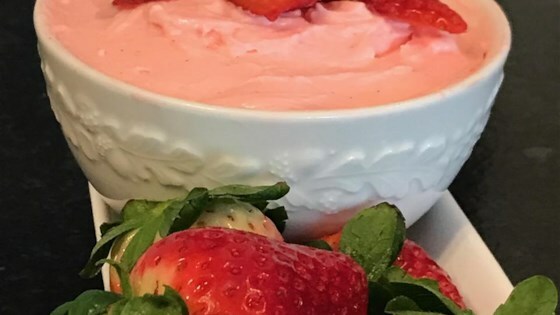 "This sweet and simple dip is fantastic with just about any fruit." Blend marshmallow creme and cream cheese until smooth. Cover and refrigerate until chilled, about 2 hours. Great dip! My Bingo crowd thought it was a fancy sweet dip. I had pound cake, graham crackers, strawberries and butter wafer crisps to accompany this yummy dip. a friend made this with cinnamon.. wonderful! Excellent! My kids and husband loved this with strawberries!!! Very easy!! I loved it! My family also loved it too! It's definitely worth trying. Easy to make, sweet tasting and a crowd pleaser!